In the spring of 2015, UMD student Akquaa Anye walked into the office of Dori Decker. The then-sophomore Anye was studying biochemistry and wanted to do something outside of her classes. “I was looking to volunteer in the medical field,” Anye said. During that meeting, Anye explained that she was interested in serving the community. Decker was looking to create a student group that was an extension of Health Services. By the end of their conversation, they had created a new organization: the Wellness Advocates, that would be geared towards making sure UMD students were doing well. When she walked out of the office that day, Anye said that she was shocked. Decker, a graduate of UMD, has spent most of her life teaching others and working with students. She joined the Peace Corps when she was 22 and worked in Tanzania, where she taught high school biology. In Tanzania, Decker lived in the government boarding school where she taught. The town did not have a community library, so she taught her classes using her own textbooks from college. “[The students] had such a thirst for knowledge,” she said. To get to the town on Lake Victoria, Decker said that she either had to fly or take a bus through the Serengeti. Decker said she appreciated the similarities to Lake Superior that the area had. She said she felt very close to the community as well. Every Saturday night she would go to the disco with friends. She also started and coached a volleyball team and taught nursing students first aid. “We can be at home in so many different places in the world no matter how different the culture,” Decker said. 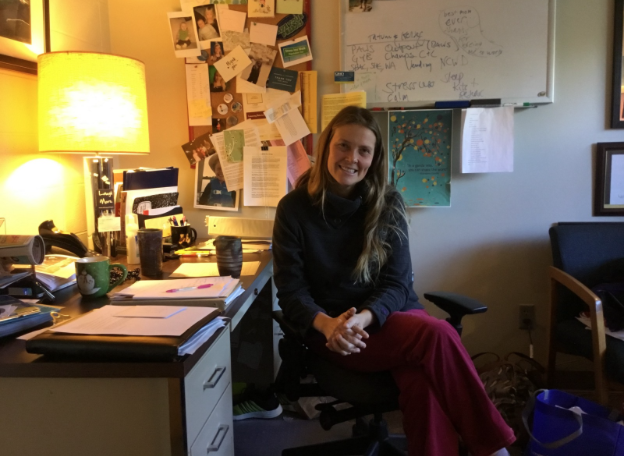 Shortly after returning from the Peace Corps, Decker went back to UMD for her teaching certificate and began teaching at a charter school in Bemidji. She said that it was there that she realized science was her passion. Decker then got her master’s in neuroscience from the University of Iowa. She had been out of Duluth for 10 years and wanted to come back, so she took a job at Health Services. According to Decker, 50 percent of UMD students say stress impacts their academics. She creates resources that can help students manage stress and stay healthy, with campus events like Pet Away Worry and Stress (PAWS) and Calm sessions in the library. Health Services conducts surveys to gauge student wellness. According to a 2015 survey, 33 percent of UMD students say that they are unable to manage their stress level. The survey also indicated that untreated stress can lead to other medical conditions. “We use the data to guide the programming that we do,” Decker said.